January 4, 2019 at 12:00a.m. 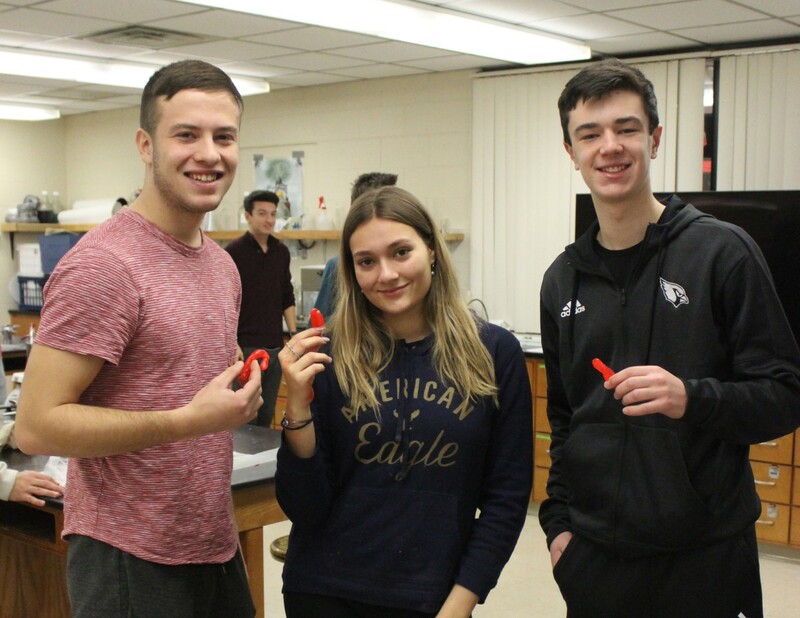 Neighbors | Abby Slanker.Canfield High School juniors, from left, Mario Mavar, Emily Riley-Gomez and Brayden Beck showed off their finished products of Variegated Disaccharide “J” Tubes, also known as candy canes, after following a scientific recipe in Tom Slaven’s chemistry class. Neighbors | Abby Slanker.Canfield High School chemistry teacher Tom Slaven helped two of his chemistry students as they created Variegated Disaccharide “J” Tubes, also known as candy canes, in his class on Dec. 18. Neighbors | Abby Slanker.Canfield High School chemistry student Sydney Kinkade rolled out her Variegated Disaccharide “J” Tube, also known as a candy cane, in chemistry class on Dec. 18. Canfield High School students in Tom Slaven’s AP Chemistry and Advanced Chemistry 2 classes celebrated the holidays with some hands-on science and a little fun on Dec. 18. Before the students started their holiday break, they constructed Variegated Disaccharide “J” Tubes, also known as candy canes. The chemistry students followed a scientific recipe only a chemist could read, and comprehend, to create the classic holiday favorite. “I did this for the first time last year and the students really had fun with it. I wanted to continue it this year with my students and they seem to be having a good time with it, too. The only thing is, I have to do most of the clean up when they‘re done, but I enjoy this and am willing to do it,” Slaven said. The students could choose from a variety of colors using food coloring, but the taste of peppermint was the same as the classic candy cane. After following the recipe, the students pulled the mixture, like taffy, into long tubes and then twisted it into the recognizable shape of a candy cane. Slaven also said the fun project goes hand in hand with what the students are studying. “This project relates to our content. We are studying chemical bonding and crystals, so this project is a nice example of crystallization,” Slaven said. At the end of class, the students packed up their Variegated Disaccharide “J” Tubes to take home for the holidays. “They do eat them. They take them home to eat and I think some of them actually end up being turned into little candy cane bites,” Slaven said. December 23, 2017 12:08 a.m.